2. Do you use any kind of genetically modified seed? Why or why not? And if so, what type(s)? M. Bendzela/Dow Farm: No GMOs, simply because they’re not available to small farmers. I hesitate even to call myself “farmer,” which makes me think of thousands of acres and huge equipment in the Midwest (where I grew up). I’m more comfortable with “grower” or “market gardener.” I’d plant GMOs if they were available. Well, depending on what our customers thought about it, of course. Popular opinion is an issue. Most of our friends and customers are very liberal, and liberals’ marching orders demand that they hate hate hate GMOs. We’re very old-fashioned here, but I have a foot in the future as well as one in the past. 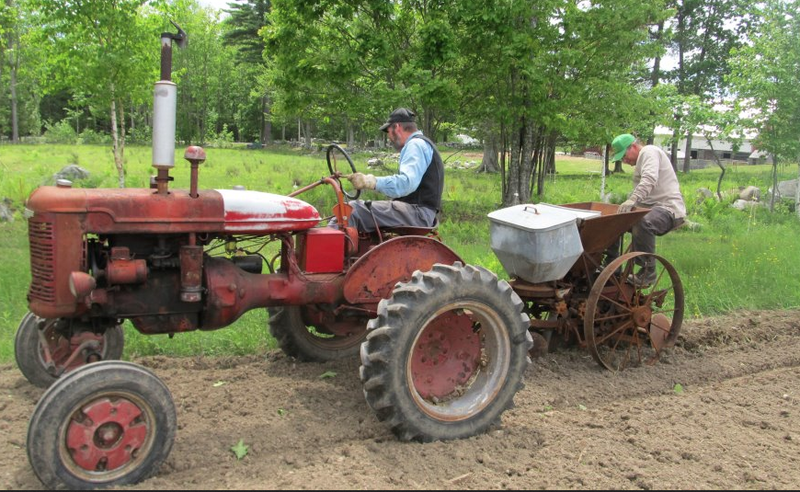 Here’s how we plant potatoes (see photo below). I’d plant genetically-engineered potatoes the same way, if we could ever get them. Potato planting at Dow Farm. Pictured are Don Essman (left) and Mike Bendzela (right). B. Womack/Homestead Hill Farm: Presently, we do NOT use genetically modified seed. GM seeds are not available for the crops we grow. We do, however, find ourselves talking about GMOs constantly. Our animals eat grain (and that opens a whole ‘nother can of worms…) The only options at present for feed grains are “certified organic” and well… not. Certified organic feed is at least double the cost of “not”. We have been doing this whole thing since long before GMOs became an issue and our animals have always done extremely well on regular feed, so it doesn’t seem economically prudent to make a switch. It is our customers’ concern with the whole GMO in feed thing that got me interested in researching the subject of genetically modified organisms. Since we are on a first name basis with the feed mill owner, he was my first information source when it came to GMO feed. He was astounded at the questions and concerns from our customers. He pointed out that much of the information that is constantly repeated in internet-land is totally and utterly false. While the grain we use is LOCAL, I have absolutely no idea how it is produced. 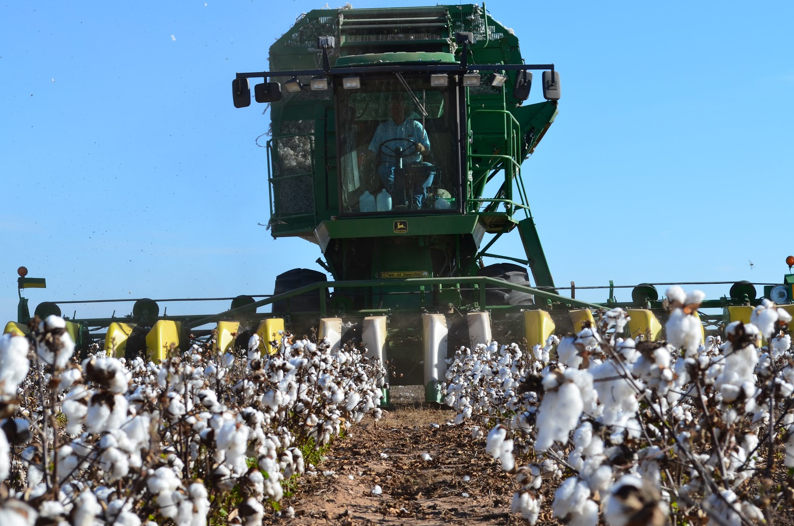 D. Wilde/West Texas Cotton Farm: I plant GM cottonseed that carry the Boll worm Resistant (Bt2) and Round Up Ready Flex (RRF) genes. The Bt2 trait makes the cotton resistant to the cotton boll worm, our major pest pressure. Once I started planting the Bt2 cottonseed, I was able to stop spraying insecticide. Since I don’t spray insecticide, the beneficial insects are now flourishing and controlling the minor pests naturally. Without the Bt2 trait, I would have to spray several times a year to control the boll worm, which leads to spraying for other pests because the beneficial insects are effected also. In a recent trip to Brazil, the farmers there told us that they don’t use GM cottonseed and they spray up to 13 times for insects. Dry land cotton farm owned by Daniel and Suzie Wilde near San Angelo in West Central Texas. Cotton pictured here contains a genetic trait which makes it resistant to the boll worm. The Round Up Ready Flex trait allows me to spray Round Up, a weed herbicide, over my growing cotton at any point during the year. However, after only a couple of years with the RRF trait, I was able to clean my fields so well with timely applications that there are very few weeds left to go to seed. Therefore, I only apply 2 applications of Round Up per year. The second application is only applied at the spots in the field that have weed pressure. T(If we receive rainfall at unusual times, this can lead to a crop of weeds that may require another spot application.) 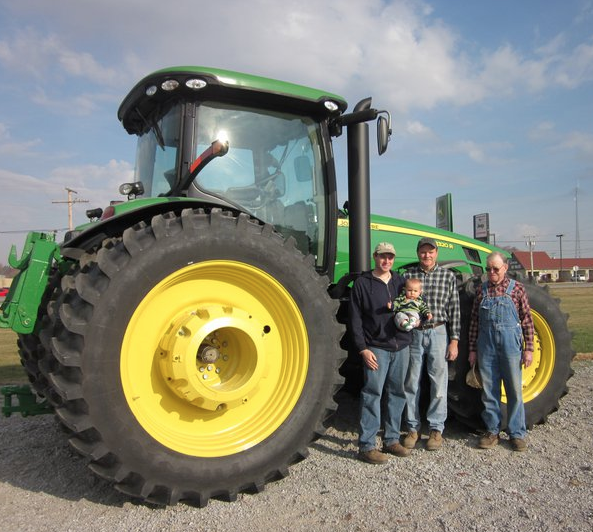 The clean fields don’t require tractors and plows in the field any longer. Back before the the RRF cottonseed, we would use a knifing plow to keep the weeds clean several times throughout the growing season. J. Hoadley/Slow Money Farm: No we don’t – mainly because, despite what many think, it’s just not available for what we do. We also have a personal preference for conserving heritage/heirloom varieties. B. Scott/corn, soybeans, popcorn & wheat farmer: All our of soybeans have been Roundup Ready for several years. RR soybeans fields have really great weed control on our farm. We rotate our crops and the types of herbicides we use which are important parts of weed control. Most all of our dent corn contains multiple traits known and triple stacks. These are Roundup Ready and have multiple events for insect resistance. Most of what we planted this year is also tolerant to Liberty Link (glufosinate) herbicide. For Bt fields we do have to plant refuge acres that contain non-Bt corn to prevent resistance forming. This refuge is now being integrated as refuge-in-a-bag where the refuge corn is mixed in with the Bt as opposed to two separate products. I think this is a good thing as it will prevent some of those farms who plant corn after corn and don’t take the time to plant a refuge from doing so. Waxy corn generally is not GMO. We’ve had some RR varieties in the past, but don’t spray Roundup on that corn because we have non-RR corn in the same field. Waxy is a big thing in the immediate area because there is a market, but I find you don’t have to go far to find a corn farmer who doesn’t know about waxy. So nationwide it is a small market. Breeders have a hard enough time taking a strong hybrid and breeding a waxy version that performs well. Pioneer had 5 or 6 varieties for use to choose from this season vs dozens of dent corn choices. 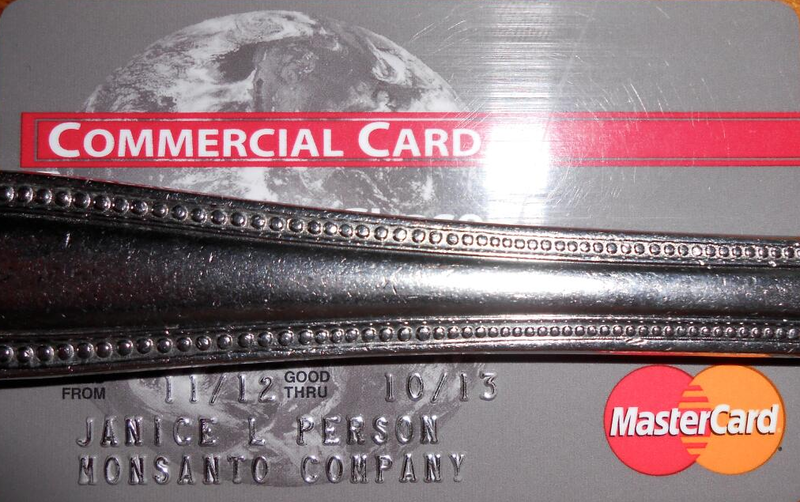 The market isn’t large enough to support the cost of making GMO waxy. That being said I think it’s good we have at least half our corn crop where we can’t spray glyphosate. That way we aren’t adding to that selective pressure that leads to resistance. Same goes for popcorn. Right now there is no such thing as a GMO popcorn plant available. Popcorn is not as tough a plant as field corn, so it will show signs of stress before the rest of our corn given similar circumstances. All our corn and popcorn comes with seed treatments and so do most of our soybeans. Between seed treatments and Bt it’s a pretty rare thing for us to have to come in with a sprayer or airplane during the summer to take care of any pests. The good thing about different forms of Bt is that they are very specific in what pests they control vs spraying a pesticide over the entire field. Also we purchased a new planter in 2012 and did not equip it with a liquid application system. This means we are no longer applying liquid fertilizer at planting or the insecticide Capture as we were doing in the past. 1. Who or what is your market? M. Bendzela/Dow Farm: We went from four subscribers in 2011, to ten in 2012, to nineteen this year. We’re what you would call a traditional CSA. We also take what we can to a small farmers market in Gorham, Maine. This is not a big-time operation. I have a “real” job, of course: I teach writing at the University of Southern Maine. I’m on a leave-of-absence from a volunteer fire-rescue gig with our town until I figure out how well the farm is going to do and whether it will persist. B. Womack/Homestead Hill Farm: All our products are sold directly to the end consumer, primarily at the Staunton/Augusta Farmers Market. D. Wilde/West Texas Cotton Farm: The dryland cotton that we raise here is of lower quality (shorter fibers and less strength.) This leads to our cotton being used for lower end cotton products, not the luxury shirts and sheets. Due to this, most of our cotton is exported to China and India where they have the proper mills to weave this quality of cotton. J. Hoadley/Slow Money Farm: We market to those who want food choices and transparency. When people buy a group of birds or some meat rabbits for us, they can do so with confidence in knowing where they were raised and what they ate. They have the option to follow the growth of their food, should they care to. It costs a little more sometimes, but often we’re competitive with grocery stores. We normally sell direct to the customer. Awhile back I put out an open call to farmers who might be interested in answering some questions about their farms and farming practices. I wanted to hear from big operations, little operations, those that use GMOs, those that don’t. The responses were enthusiastic, varied, and I am excited to present the finished results today. I sent out questionnaires to eight farmers and received five back. Though not every type of grain, crop or produce farm is represented below, it is, I think, a fair representation of styles of farming in America today. I still welcome input from any other farmers who would like to participate and I very much appreciate the thoughtful answers I received. 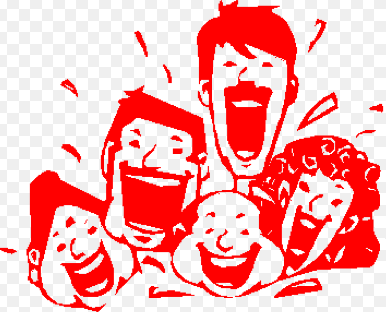 If you are interested in future involvement please leave a comment below or email sleuth4health@gmail.com. Before I go any further I’d like to say a few words about the scope of farmers and what they mean to our world through my eyes. I admit, I don’t know a lot about farming. I have a stepbrother, Pat, who with the help of his family, owns and operates a large wheat operation in Eastern Oregon. Their land is so vast over there that Pat has trained for a few marathons just running about his fields! With no irrigation, their farm is completely dependent on rain – in north eastern Oregon (semi-arid climate). I have heard stories of fly-by-the-seat-of-your-pants growing seasons and broken combine air conditioners during harvest. That is the extent of what I know about farming. When I take a step back and ponder all that is dependent on what farmers grow, it is more than humbling. I can start with food, clothing, shelter and get much more specific from there but I feel those three italicized words can stand alone. Does it get more basic than that? Farmers, thank you for all you do. You sustain us. I’ve truly enjoyed this glimpse into your world. To start, let’s meet the farmers – in their own words! Mike Bendzela of Dow Farm Enterprise: I’m one of four partners at Dow Farm Enterprise, a (very) small market farm and CSA (community supported agriculture) in Standish, Maine. My soon-to-be spouse Don Essman is on the right. Our “landlords” and co-partners, Ken Faulstich and Claudia White are in the middle. Dow Farm is a tiny flea on a big planet. We grow about a hundred different varieties of vegetable crops in Northern New England. We’re basically a home garden gone wild. All together, we cultivate just over an acre of crops, and we also have a small orchard of 85 trees, mostly “heritage” apples. 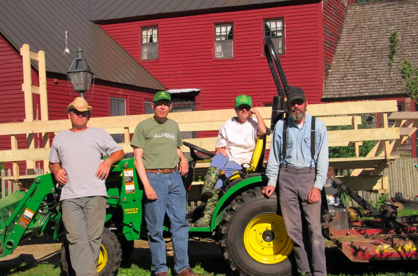 The idea was to partially restore the farm that Claudia’s great-grandfather, Herbert W. Dow, ran a century ago. We’ve found most of the apple tree varieties he planted. We add a little bit more to the vegetable plots each year. It’s monstrously difficult because the conditions here in Maine are horrendous: cold, dank, fungal, rocky, and dark, and it’s a nasty, brutish, short growing season. Visit Dow Farm Enterprise at Facebook. 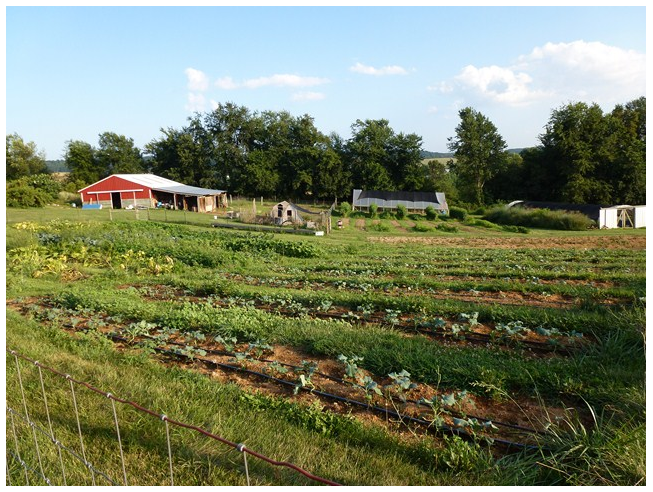 Tom and Barbara Womack of Homestead Hill Farm: Our farm is a small, diverse operation located in Southern Augusta County, Virginia – in the heart of the Shenandoah Valley. Originally, it was a whole-family operation. Now that the chicks have grown and flown, it’s just us empty-nesters. We grow all sorts of vegetables and fruits as well as raise chickens and sheep. 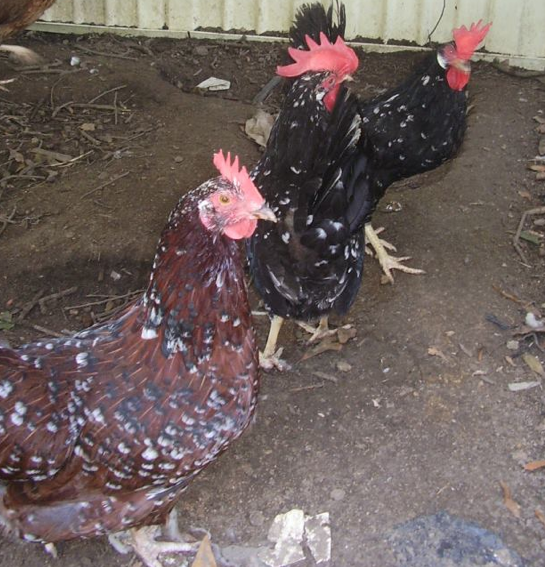 Our chickens provide delicious eggs and excellent meat. The sheep keep the grass mowed and provide lamb products so tasty that no one seems to miss the mint jelly. 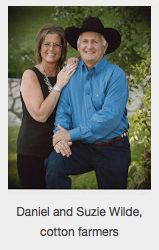 Daniel and Suzie Wilde: We are dry land cotton farmers near San Angelo in West Central Texas. We grow cotton without any irrigation on the edge of the Chihuahuan Desert. Jan Hoadley of Slow Money Farm: I’m an Illinois native now in northwest Alabama getting ready to expand into Kentucky. 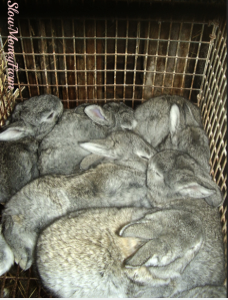 We do custom options – rabbits, poultry, produce and herbs right now. 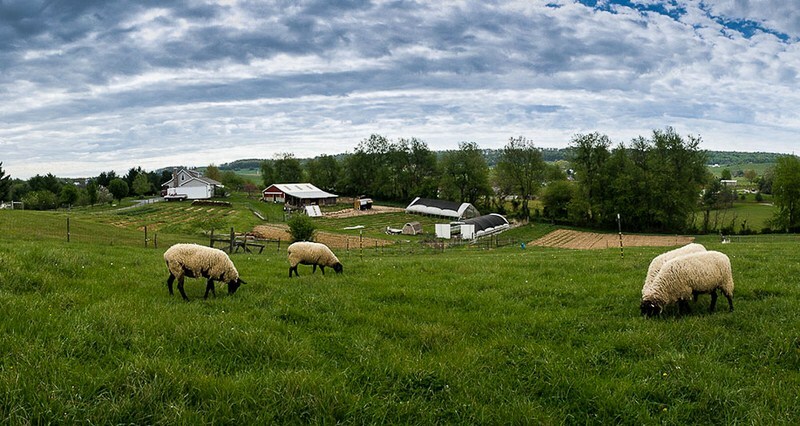 We’ll be expanding into larger stock – sheep, pigs, cattle – with the purchase of land in Kentucky. We just don’t have room here! We do farm shares, food packages and CSA with flexibility to allow for food choices. There’s a special focus on heritage/heirloom production. Visit Slow Money Farm on Facebook. 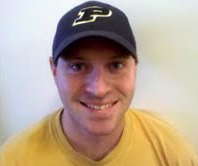 Brian Scott: I’m a 4th generation farmer growing corn, soybeans, popcorn, and wheat in Northwest Indiana. More specifically we raise dent corn, waxy corn, commercial soybeans, and soybeans for seed as well. We grow soybean seed for two different companies. Visit Brian’s blog: The Farmer’s Life. I asked each of these farmers a short set of questions. In the next post you will find each question followed by the answers in the same order as above. It was extremely interesting to get different perspectives on the same issues. Happy reading! Awhile back I received an email from Janice Person, the Monsanto social media gal whom many of you know. 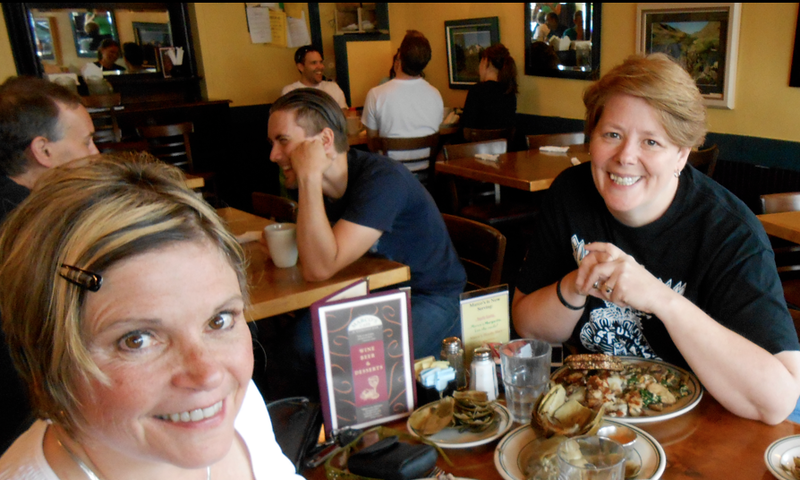 She was coming to Portland in late June and wanted to know if we could meet up for lunch. She admitted that it might be surprising for me to receive such an email from a Monsanto employee but would I consider meeting her? She also said that she would totally understand if I was not comfortable. At the time I received her email, I was coming around about GMOs, realizing that they were not dangerous like all the activist literature had said they were, but my feelings about Big Ag, Monsanto and the like, those views were more complicated to sort through. Nonetheless I agreed to meet with her. This weekend it happened. We were scheduled to meet Saturday night shortly after her flight arrived. I was ready to sit down and have a beer with a Monsanto employee. Woo hoo! As luck would have it, her flight was delayed until the wee small hours, so we didn’t meet until Sunday brunch. No, I didn’t order a beer but I did right by Portland and ordered coffee and Janice and I sat down to lunch and got acquainted. She is as nice as they come. Full disclosure: Monsanto bought my lunch via Janice, which I appreciate. That doesn’t, however, make me a Monsanto shill. I would need a heck of a lot more than lunch to be a shill! She is the first person I have actually met face to face since I started on my new journey of following science. I realize now that a community has begun to form around this endeavor. Janice informed me of a very irreverent facebook group that’s sole purpose is to poke fun at anti-GMO activists and so I went there, joined, and was welcomed – um, rather irreverently, but welcomed nonetheless. To add to the fun and as fate would have it, on Monday I taped an interview via Skype with Rick at Green State TV, or GSTV, an internet media outlet focused on agriculture and the environment sponsored by another major biotech company, Syngenta. When the video becomes available, I will post it. If you would have asked me in, say, January, if I’d be eating brunch with a Monsanto employee on Sunday and doing an interview with a Syngenta employee on Monday I would have said you were out of your mind! Sleuth4Health, aka, Julee K is due for some rest and relaxation on the beautiful island of Maui. I will be partaking of fruity drinks garnished with umbrellas, all the fresh pineapple and macadamia nuts I can eat, and of course, SCUBA diving. 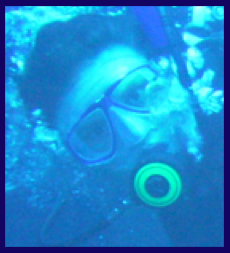 I hope to be under the sea most of the time as it is the one place where I truly feel free. I am leaving my home and my cat in the hands of my adult children. Think good thoughts! In my absence I will be posting a few of the more popular former articles from the blog. For example, if you missed the “In their Own Words” farmer Q & A article or couldn’t finish it because it was too long, I’m going to repost it in shorter segments. 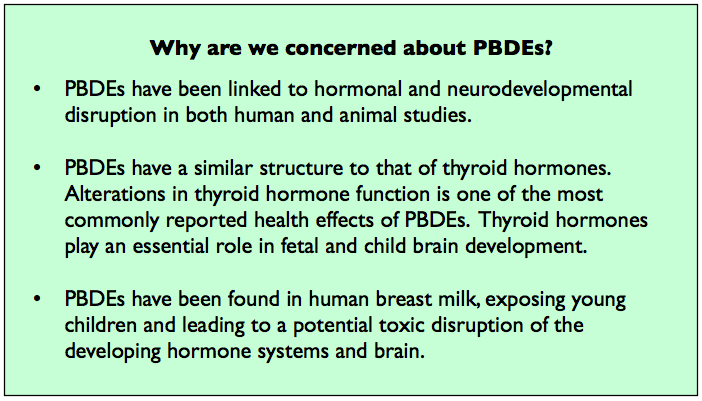 PBDEs Proven Dangerous But Activists Focus Only On GMOs. Why? Why Aren’t Activists Barking Up This Tree? For well over a month now, I have been trying to get across my evidence-based view that GMOs are not to be blamed for society’s health problems. So it’s time to present something that actually could be responsible for at least some of our health problems. Allow me to present a well cited but rarely discussed health bugaboo that may actually live up to its labels as endocrine disruptor, excitotoxin, maker of cognitive problems in children. In a recent post I wrote a metaphor about trees in a park. I said there are many trees in said park but the largest group of people is gathered around just one tree, the GMO tree, and they are barking – heck, they are snarling up this tree. They want labels. They want skulls and crossbones. They want bans. I’m sauntering over to a different tree now and joining a much smaller crowd. This crowd is more subdued and includes some of the same types of people who are over at the other tree – consumer moms, environmental activists and the like, but there are also mainstream scientists and members of regulatory agencies in this group. 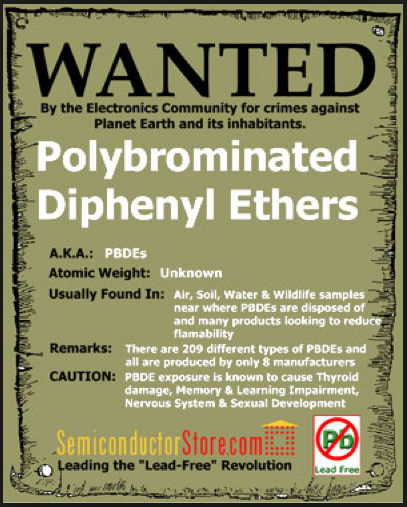 Flame retardants and specifically, a class of flame retardants known as PBDEs (Polybrominated Diphenyl eithers) are my topic today. There is overwhelming evidence – reliable, scientific, mainstream, widely accepted evidence indicating clear and present health dangers. The EPA has taken action and bans are either already in place or in the works. Even if all PBDEs are banned, however, it’s a situation much like with lead paint or mercury – the stuff still hangs around in items manufactured prior to the ban date. Below are three different article excerpts about BPDEs. Bold emphasis is mine. When you buy food for your family, you can read the ingredients list and know what you’re putting into your body. 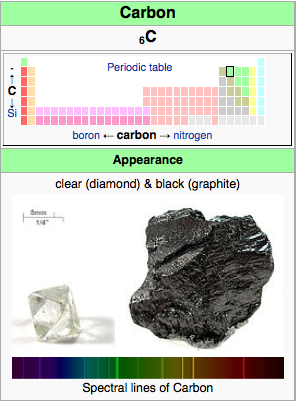 But do you know what’s in your clothing, your furniture, and your car upholstery? The Center for Environmental Research and Children’s Health (CERCH) posted an excellent fact sheet/pdf on their website. Apparently if you live in California, it is a worse situation as indicated in the CERCH table (left). I ask – where is the public outcry? Where is the call for labeling of products that still contain decaBDE which is not yet completely out of new electronic products? Why aren’t people marching in parades wielding skull and cross bone signs over their electronics, sofas, carpets and upholstery? 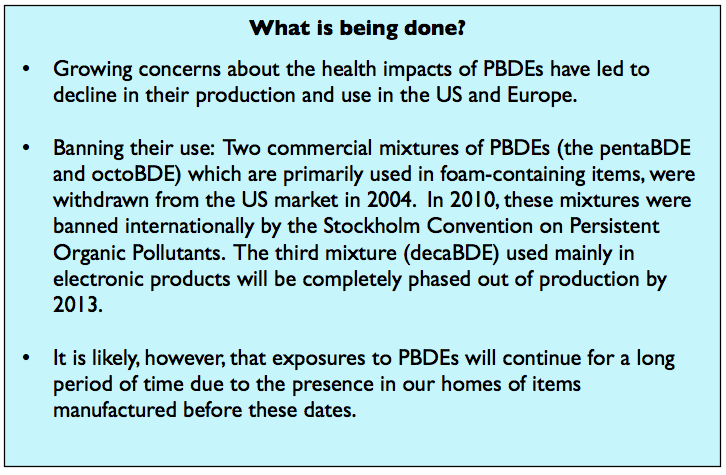 Where is the call to action to destroy older consumer products that still contain BPDEs? 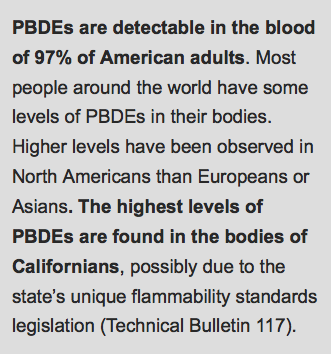 Below I have listed many additional studies, EPA notices, articles and blog posts from a variety of sources that clearly indicate real dangers from PBDEs. This is by no means all of them but I tried to include a fair sampling. It should also be noted that the EPA has not banned any GMO Foods. This article was updated at 10:32 PST.